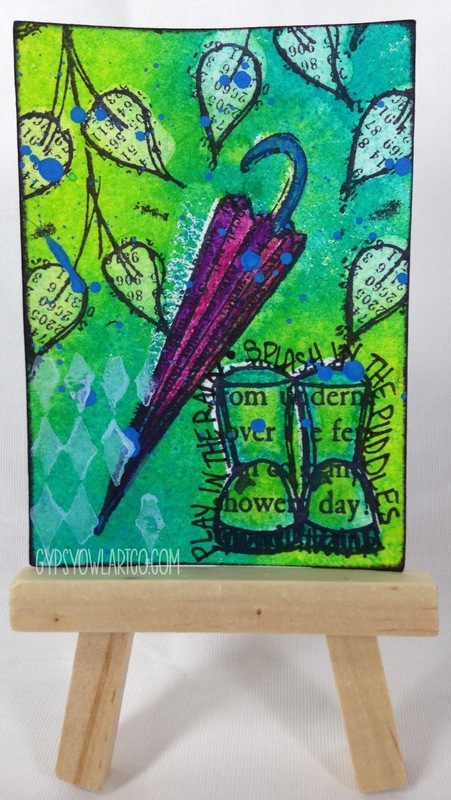 The Gypsy Owl Art Co.: ATC Monday - "April Showers"
Happy Monday y'all!! Monday's mean ATCs here on the blog and today I have a Rainy Day themed card for you! April Showers bring May Flowers! With a background of Dylusions Vibrant Turquoise and Grass, April's rains have splattered all over some Dylusions rain gear and vegitation! Rain boots and umbrella are colored with Inktense pencils while the rain spatters are made with Adirondack® Acrylic Paint Dabber in Stream. This cute little ATC was actually made way back in April for my #atcclub2015 group on Instagram. It's just taken me a really long time to get this posted! I'm particularly happy about sharing this card today because we have had a really horrible dry spell (nearly a whole month) of no rain and there is rain in the forecast for today and tomorrow! Here's hoping it actually comes. I'm off to make something! I will see y'all back here next Monday for our next edition of ATC Monday!